Last offseason, the Green Bay Packers made a controversial (at least in the state of Wisconsin) decision to pass on drafting University of Wisconsin pass rusher T.J. Watt in the first round. 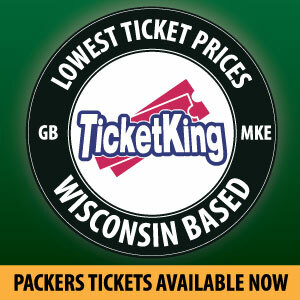 Instead, then-General Manager Ted Thompson traded down to the top of the second round and selected Washington cornerback Kevin King. With the extra selection the Packers received in the trade with Cleveland, Green Bay selected Watt’s former teammate, Vince Biegel. I am here to give my bold prediction….that the “other” Wisconsin pass rusher will lead the 2018 Packers in sacks. First off, I don’t think he will reach double digits, but I do believe he, Nick Perry, Reggie Gilbert and Clay Matthews can all bring down opposing quarterbacks in the backfield between five and nine times. Just look at last year’s Philadelphia Eagles. Nobody on that team that won the Super Bowl reached double digits in sacks (they were led by Brandon Graham’s 9.5), but four players had between five and 9.5 quarterback sacks. When watching Biegel, his effort reminds me of Matthews. When initially out of a play, the former Badger will claw his way back into the play. He will work and hustle his way into a few sacks this year. Matthews has been a master at that, especially when he was at his peak early on in his career. In speaking of Matthews, he is in the last year of his contract, and is still a solid player, despite his lack of gaudy sack totals. I do believe, however, that his days as a premier edge rusher are over. Can he still help the club? Absolutely. I think a move to inside linebacker would help him be more productive and prolong his career. He also is Clay Matthews, and his name alone makes it so defenses know where he is every snap. That will help free up rushers, like Biegel. Last season was a lost one for the former Wisconsin standout, as he had foot surgery before the season. For Badgers fans, yes, it was the same injury that forced him to miss two games his senior season at Wisconsin, losses to Michigan and Ohio State. 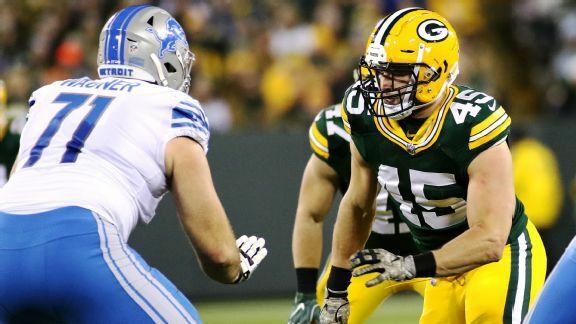 But Biegel has been upbeat during the whole process, and excited to have the entire offseason to work out and improve his game, and Green Bay is counting on him to wreak havoc on opposing offenses. After being activated from the PUP list in early November, Biegel did not have the greatest stats in the world, but he did have an impact. He only had seven tackles in nine games, but the Wisconsin Rapids product did help with a goal line stand in his first career game against Detroit. Friday on Twitter, Zach Kruse posted a video on Twitter of a play when Green Bay played Carolina last season. Biegel took on Daryl Williams, a good right tackle for the Panthers, and beat him around the edge, which forced Cam Newton to step up. When Newton did step up, Kenny Clark was waiting for him to bring him down for the loss. That is an example of Biegel having an impact without actually making a sack, or even a tackle. I believe we will see more of that in 2018…..and more actual sacks from the former Badger, as well. Much of this prediction will depend on how many snaps Biegel gets this season. Matthews, who is entering his 10th season in the league, is winding down on his career, so his snaps may be cut down a bit. Perry is injury prone, but when he is on the field, he is a solid pass rusher and will command attention, which would free up someone like Biegel. This might be an out there prediction, and with me being a Wisconsin fan, just predicting with my heart, but I believe Biegel will have a breakout season. The hiring of new defensive coordinator Mike Pettine also brings me hope for a major breakout for him. My prediction for Biegel is eight sacks and like the Eagles of 2017, Green Bay will have four players with at least five sacks. This entry was posted in Packers 2018-2019 Season and tagged clay matthews, Green Bay Packers, Nick Perry, Reggie Gilbert, Vince Biegel, Wisconsin Badgers. Bookmark the permalink. My Bold Prediction: Vince Biegel Will Lead Team in Sacks – Or he’s made of Glass, 1 of the 2.. Given Thompson drafted him injured, and he had a college injury history, my guess is he’s made of glass. The Packers will have one of the best defensive fronts in the NFL. I think Wilkerson will play a vital role and needs to return to his beginning years with the Jets. Daniels will be the leader and will motivate the others to play their best. This being said this will create holes for our EDGE rushers to sack the QB.